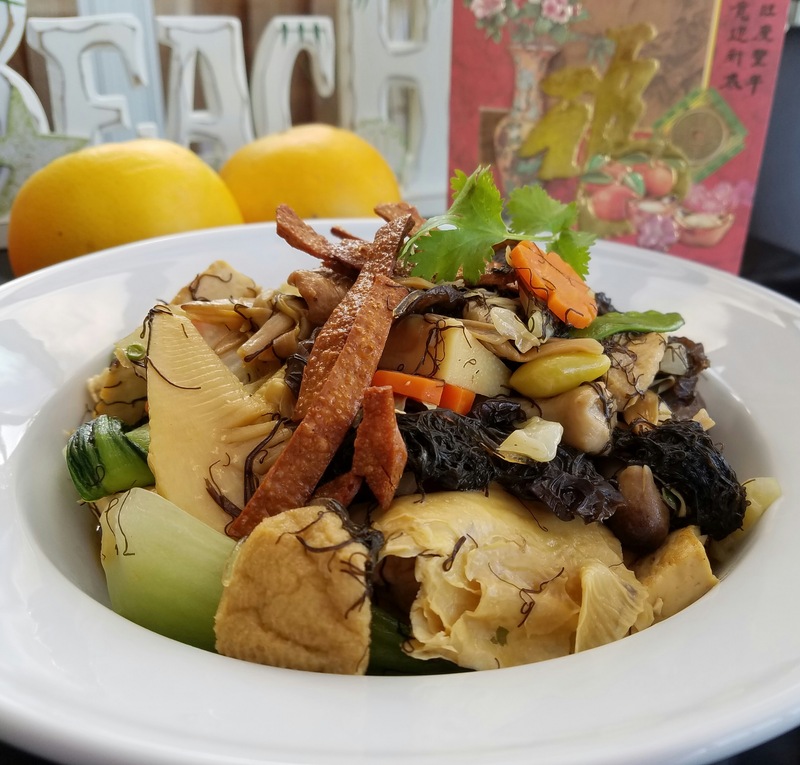 What is another good CNY vegetarian dish to cook besides my favorite Braised Mushrooms with Fatt Choy? 罗汉斋 came to mind but it requires me to assemble 18 different vegetables/vegetarian ingredients! I made a list and was able to find about half of them in the kitchen. After a whirlwind trip to the grocery store, all my ingredients are in place. So out came the dish. 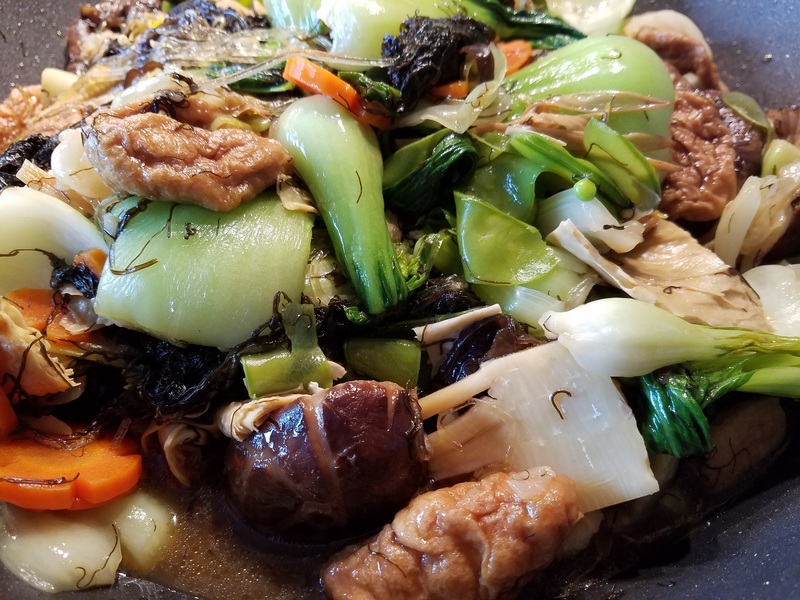 I would caution that it does take a lot of time to prepare so many ingredients and you really need a huge wok to stir fry all of them in one pot. 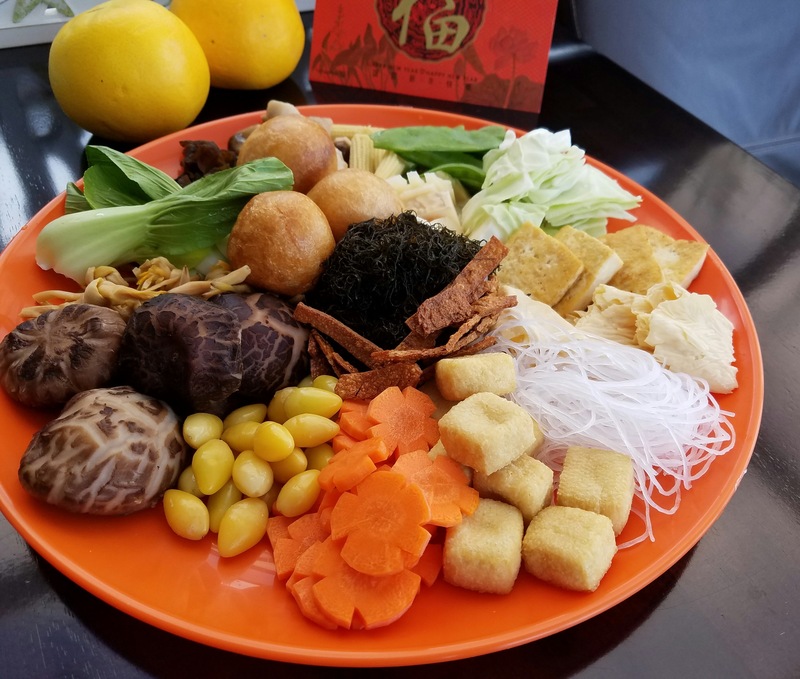 While it is auspicious and tasty, I wouldn’t attempt the full recipe more than once a year. Save it for the CNY menu! Prep Time: took me more than half a day shopping, and preparing all the ingredients. 9 Shitake mushrooms, rinsed and soaked in 2 cups water overnight. Strain the soaked mushrooms and cut off the stems. Save the liquid for stir fry later. Prepare the stir fry sauce. Add the salt, sugar, soy sauce, and vegetarian oyster sauce to the mushroom liquid, stir well and set aside. Blanch the baby bok choy and snow peas. Set aside. Heat sunflower oil in a large wok over medium high heat. Add the mushrooms and stir fry for a few minutes until mushrooms turn slightly golden. Turn up heat. Add bamboo shoots and carrots and stir fry for a couple more minutes. Add remaining ingredients including the stir fry sauce except mung bean threads, black moss, and corn starch thickening. Stir fry for a couple of minutes. Cover and simmer for another couple of minutes. Remove cover and add the black moss and mung bean threads. Cook until mung bean threads turn translucent and black moss is softened. Stir in the cornstarch thickening. Fry for a minute until sauce thickened. Garnish with fried bean curd.